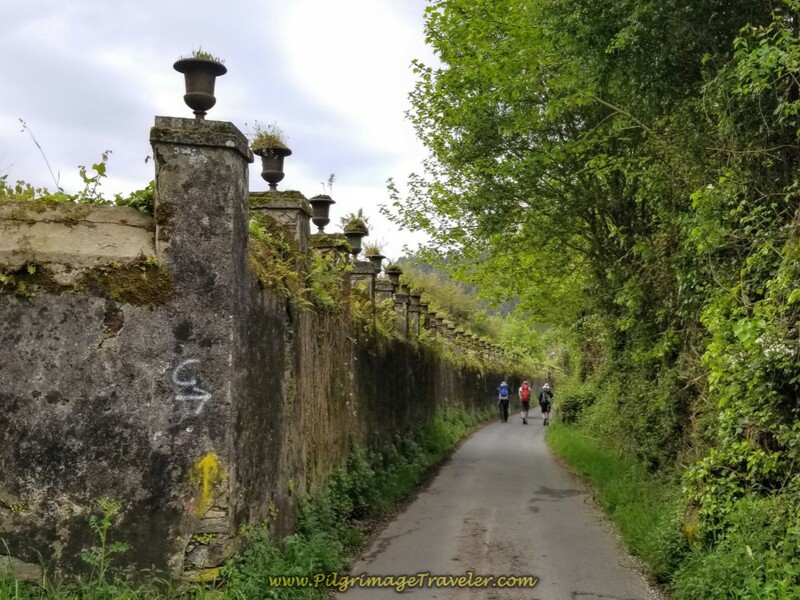 Our day four on the Camino Inglés was another trip through the lovely Galician countryside, starting from sea level in Miño, climbing steeply, then ending at sea level in Betanzos. While this section is short, because of the elevation change, it will feel strenuous. 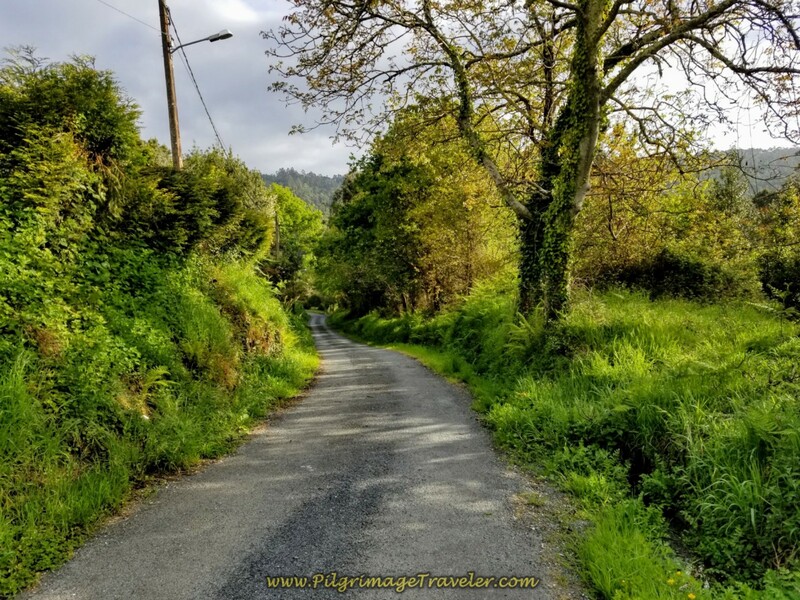 You can easily combine this day with day three or day five, which is what we chose to do, combining day four with day five to walk onward to the albergue in Presedo. 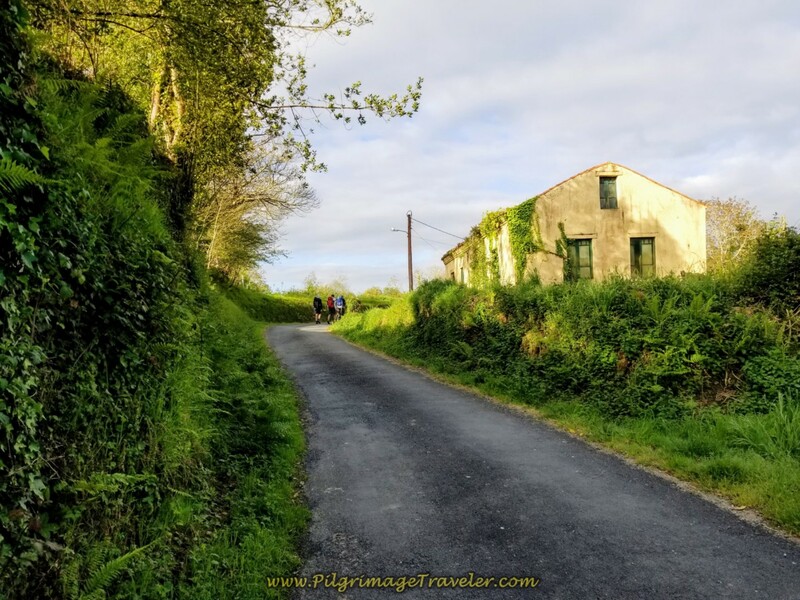 I love this quote above, because indeed, you are able to find out from what cloth you are made, when you go on any Camino, especially the ups and downs of the English Way. 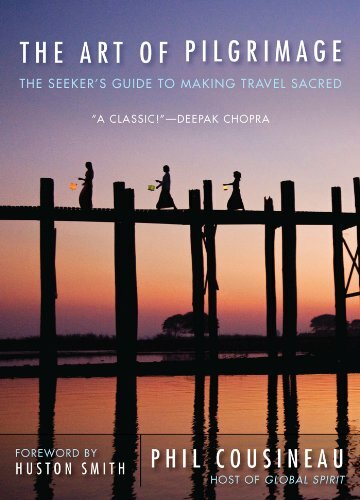 The risk of going too far is always a possibility until you become aware of your own rhythms and limitations. This self-discovery is priceless! 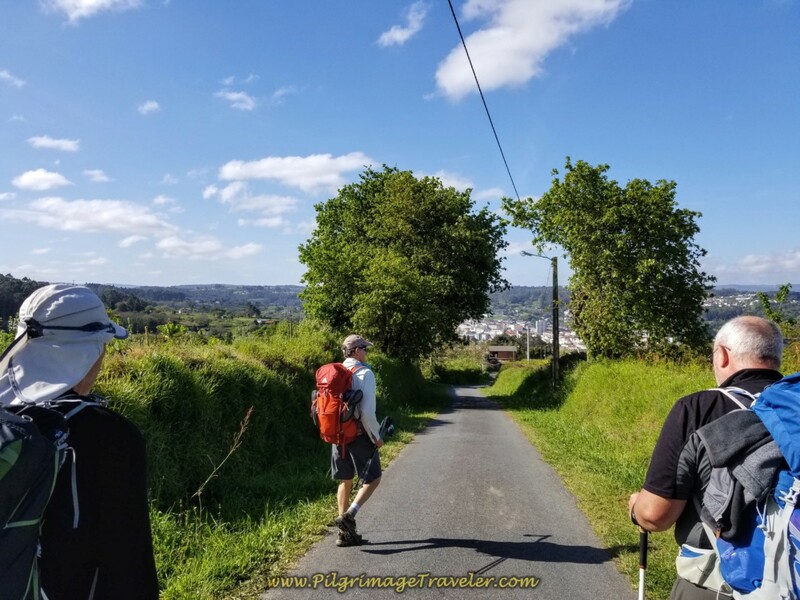 Traveling with our friend with Parkinson's, continued to make me acutely aware of not only myself, but of another and his process. Here is our day's journey. 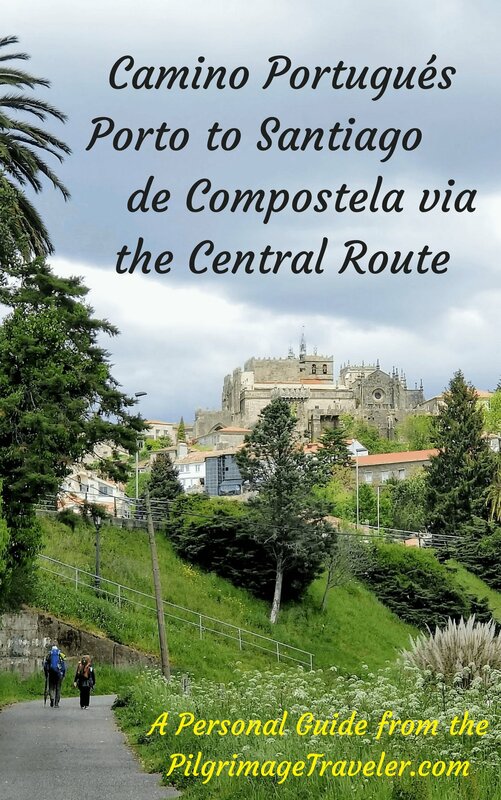 Below is our Google map of the day, fully interactive and with hotels, albergues, restaurants, cafés and supermarkets, placed on it ~ all to help you plan your own day four on the Camino Inglés! We uploaded these tracks from our actual GPS recordings for the day, so it is most accurate! Here is our elevation profile for the day. 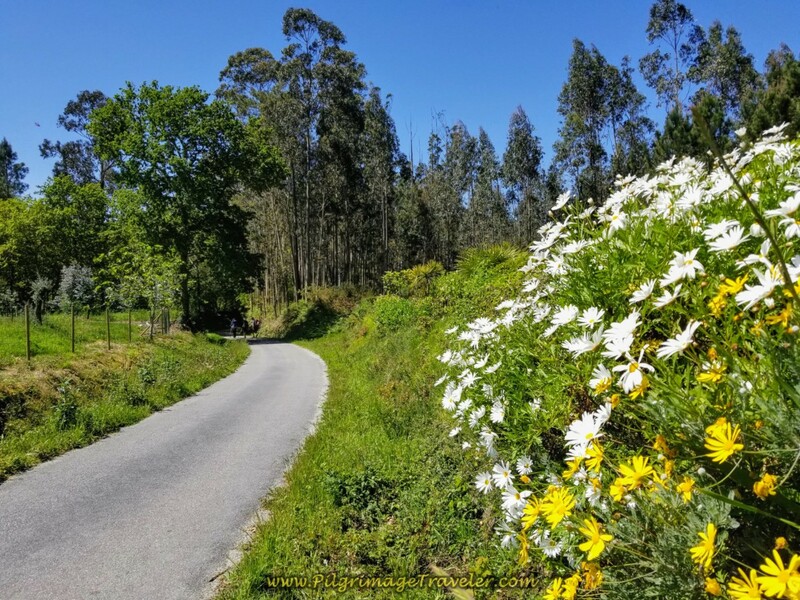 From sea level in Miño there are two significant climbs, starting at about 4.0 kilometers into the day, for a total of 378 meters (1270 feet) of accumulated climbing. 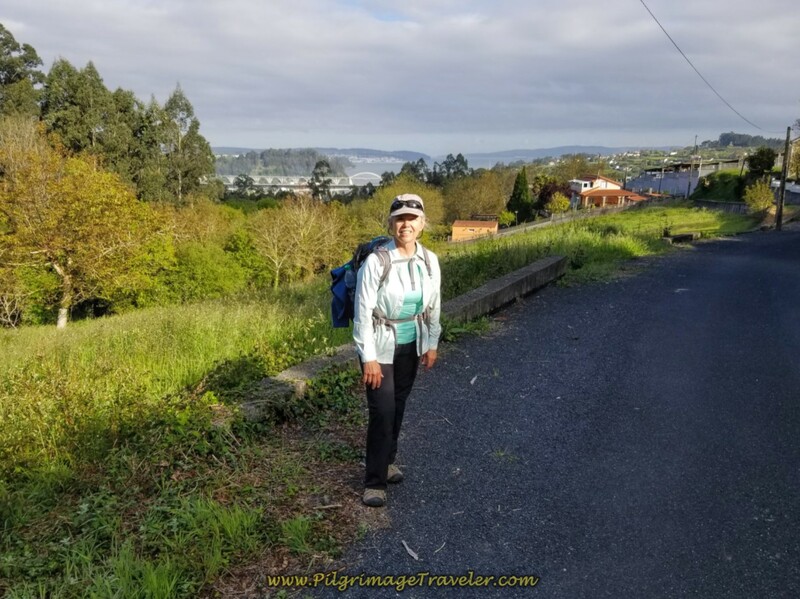 Then the day finishes with a steep descent from the top at about 7.0 kilometers, when the Camino drops you down and into Betanzos, back to sea level once again. 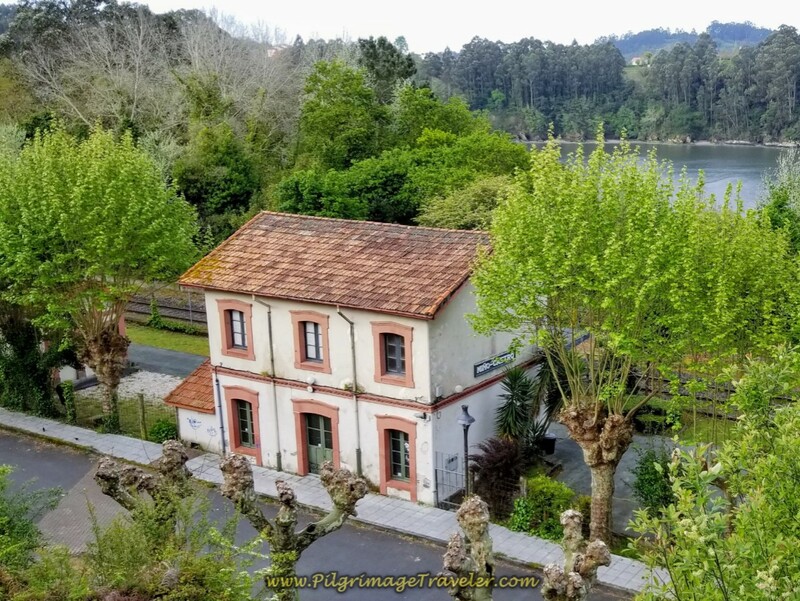 We made our own breakfast at the Albergue de Peregrinos de Miño, from purchased supplies in town the evening before. It turns out that this was a wise decision. 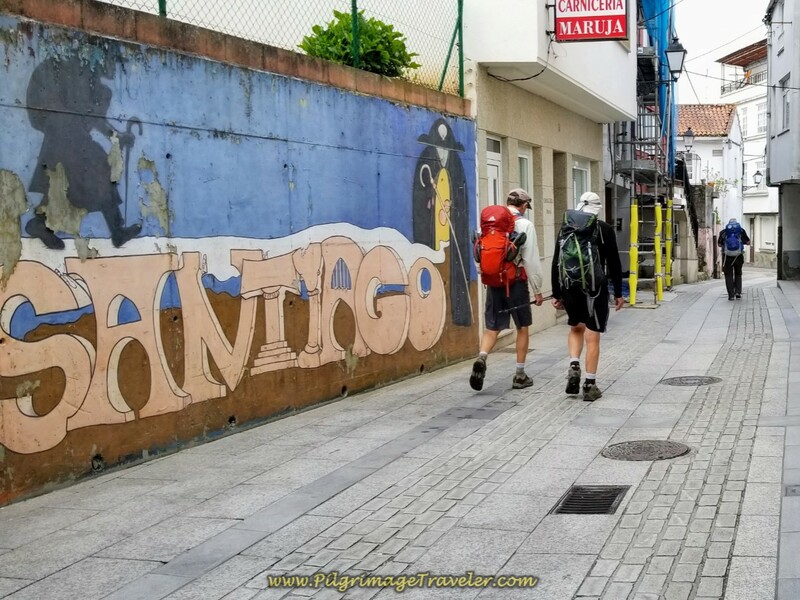 As we set off through town to join the Camino where we had left it on day three, we passed by many cafés, none of which were open as we passed, until well after 9:00 a.m. 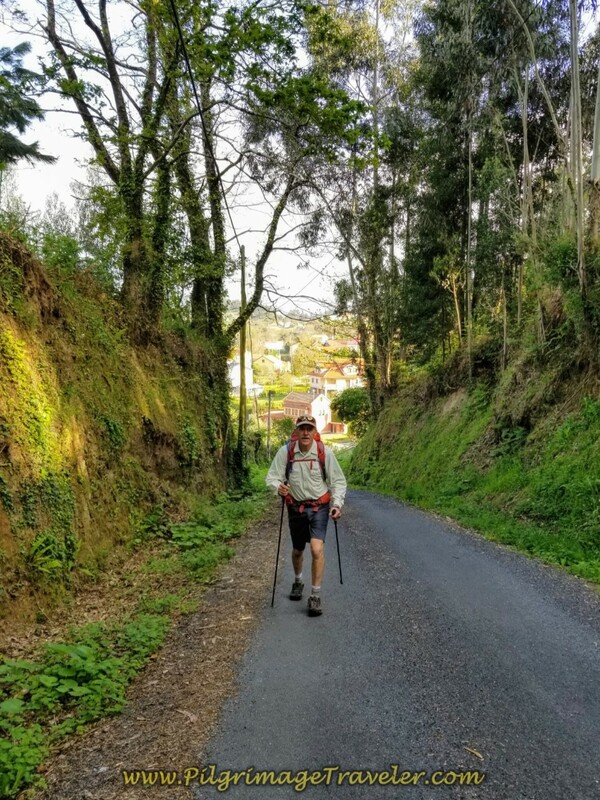 Here is our friend Rob, as together we headed off through the streets of Miño. The directional signs are good as you can see in the photo, below. We followed the directional signs, essentially straight onward through most intersections as we walked through town. 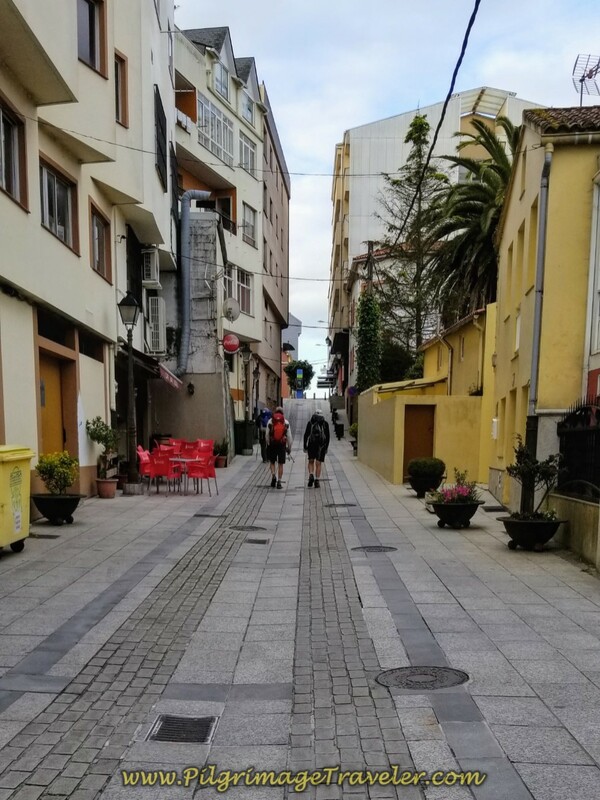 As is often the case in Spanish cities, the name of the street changes, even when the direction does not. Very soon we came across this mural, below. Just across the street from the Santiago mural is the Supermercado Coviran. It was not open at 8:00 a.m. when we walked by. Just past the supermarket is the Café Vidal, shown next, also not open. 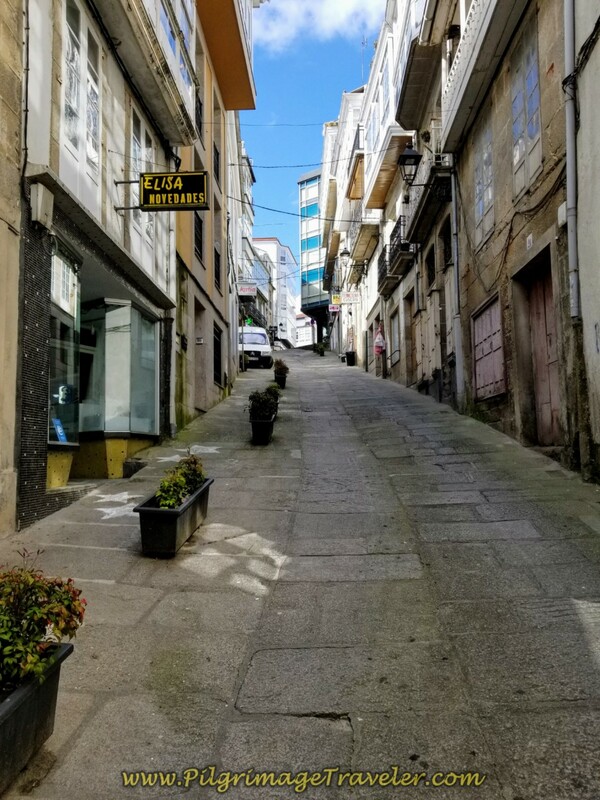 You can see that it is a mild uphill climb through town. After almost one kilometer of walking through town, still climbing up to this point, you come to this intersection below. 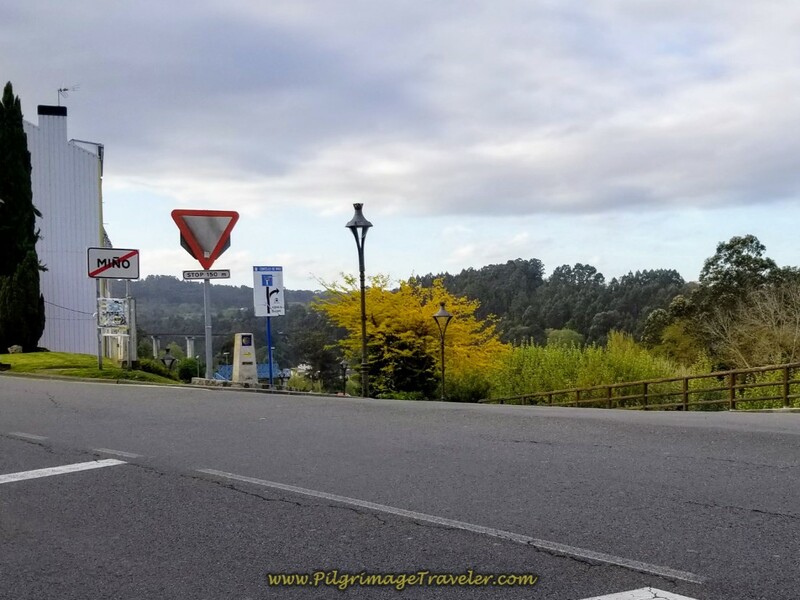 From here you are leaving Miño, and you must now follow the concrete kilometer marker to turn right, down the hill towards the Lambre River. Before you turn right, from your lofty perch above the river, if you look to your right, you can see this lookout over the river. 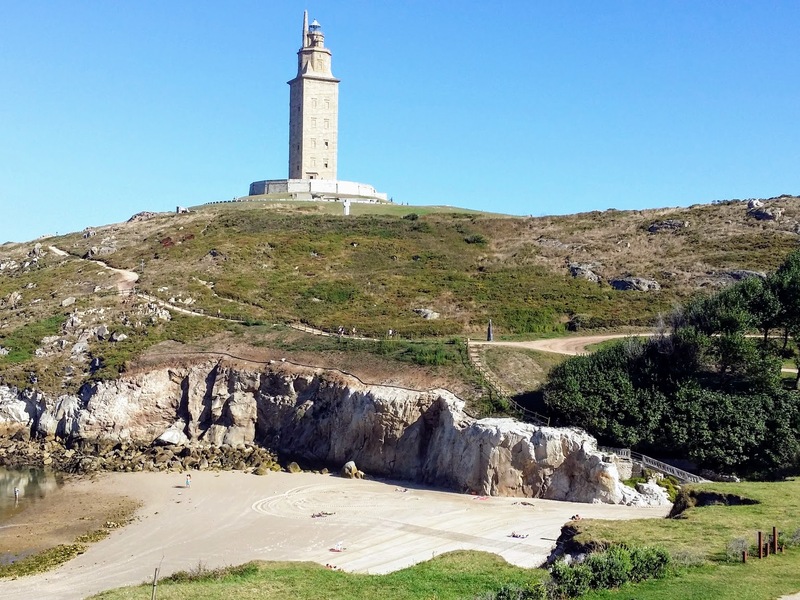 This is the Mirador de Miño, shown below. Take a moment to peer out over the lookout and take in the wonderful view. 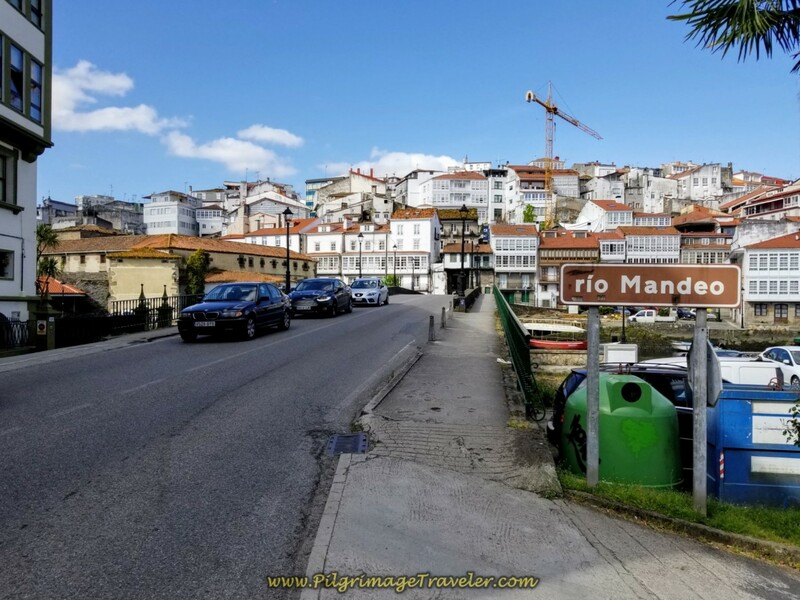 Just below the mirador you can see the Miño/Castro train station and the river behind it. 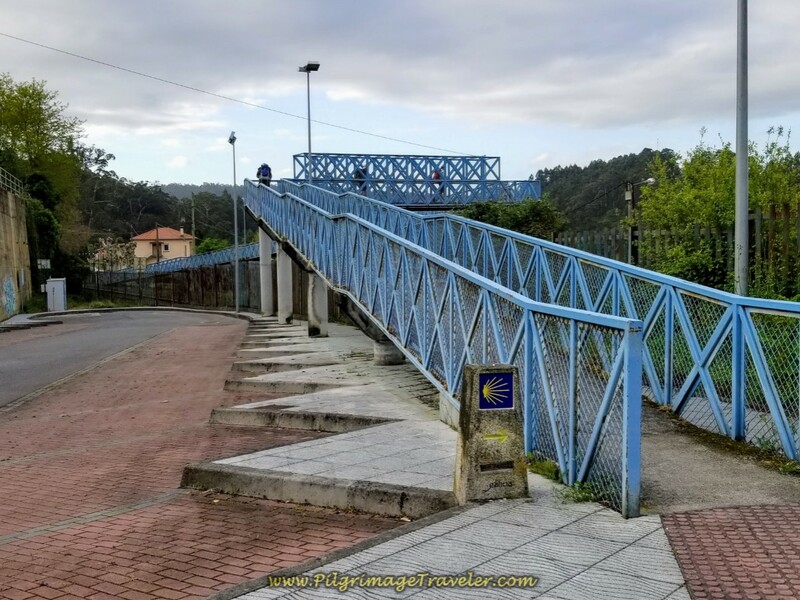 As you descend toward the river, you can see this blue pedestrian bridge several hundred meters ahead. 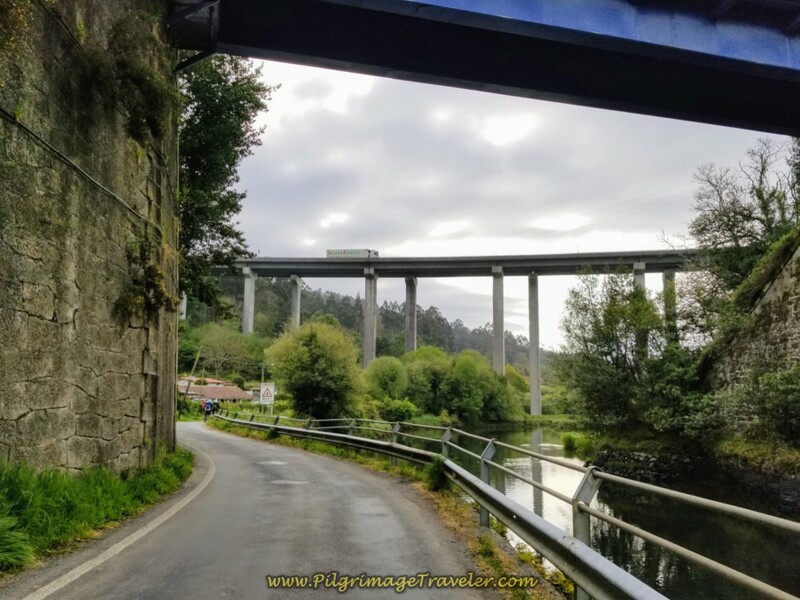 The Camino takes this bridge which walks you across the train tracks. 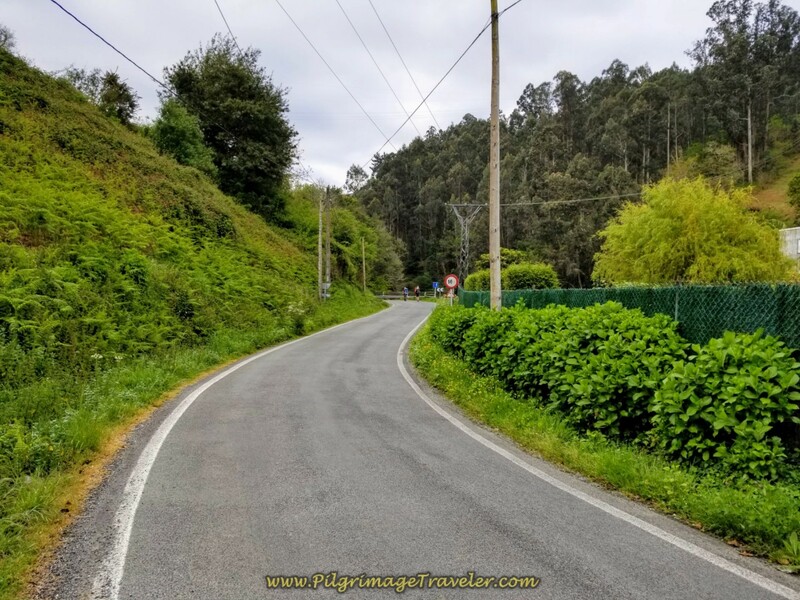 After 300 meters on the decent to the river and to the other side of the pedestrian bridge, you pick up the Rúa Alameda, a nicely shaded and rural road. Within a short distance, you walk by the walls of this estate, shown below. 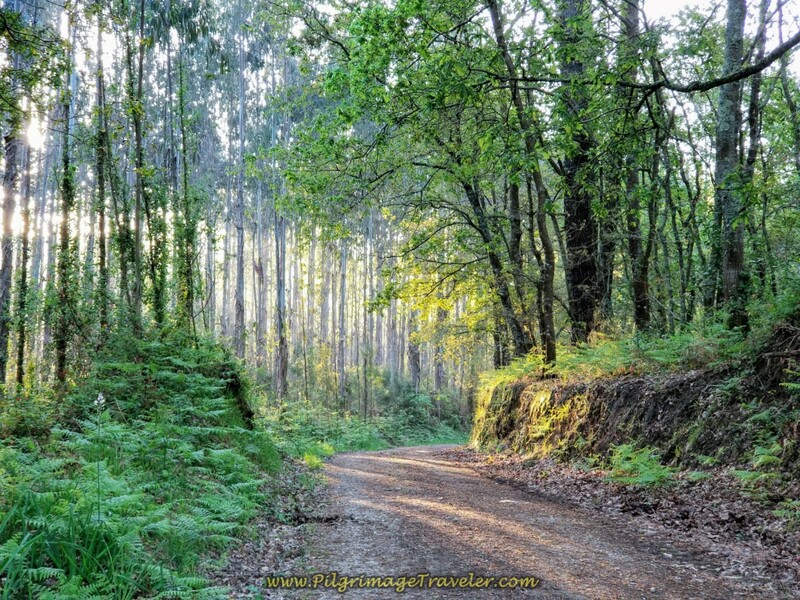 Farther along the street, the forest opens and you can see the Lambre River. You pass by a natural area, shown below, with a boardwalk that leads you to the Alameda Beach. It is a pity that we did not spend much time here, as it was so lovely along the River in the spring. 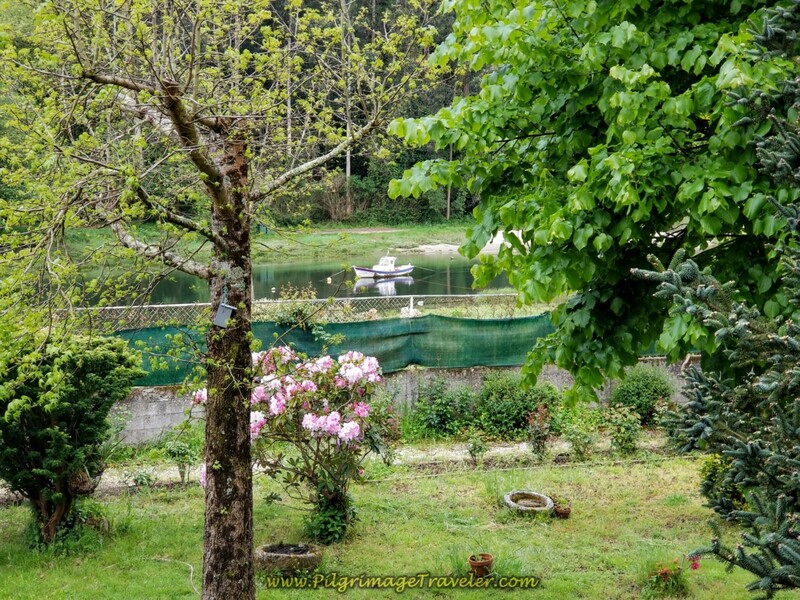 We walked into the hamlet called A Ponte do Porco, were this view of a boat on the river caught my eye. We were next to the Alameda Mesón, a café by the river, which was not open at 9:15 in the morning. I would have loved to have sipped a café con leche here and lingered awhile. Alas, we kept on walking. 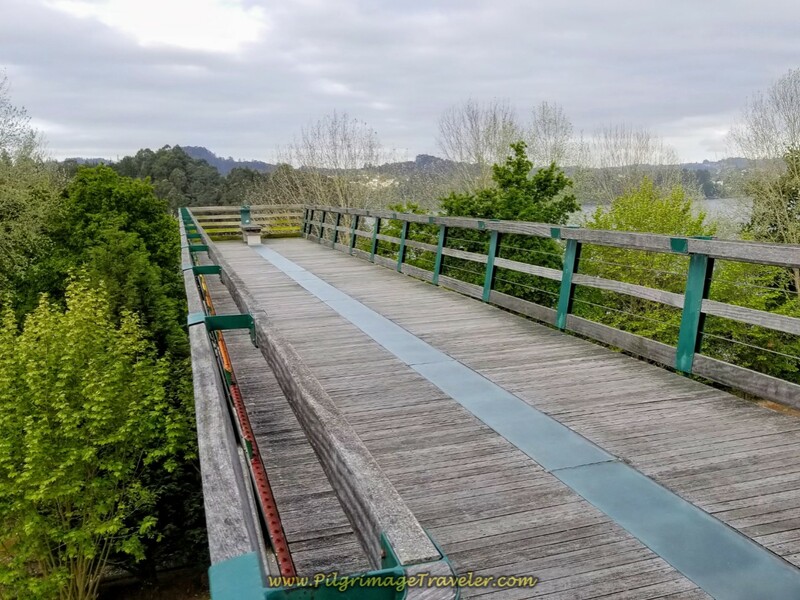 It is after about 1/2 kilometer along the Rúa Alameda, in the town of A Ponte do Porco, when we crossed under the N-651 and turned right on yet another country road, the DP-4804, shown below. 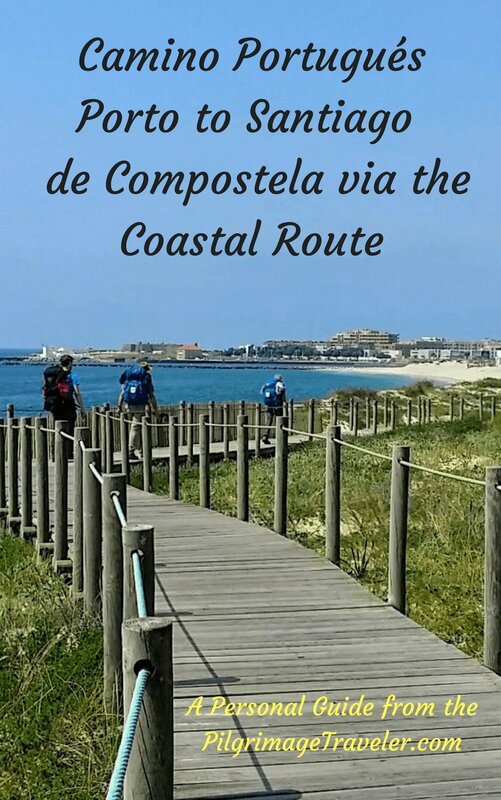 It is a full 1.5 kilometers along the DP-4804 and the walk is relatively flat. After this distance, you are directed to turn right, off the road and onto this medieval bridge, below. 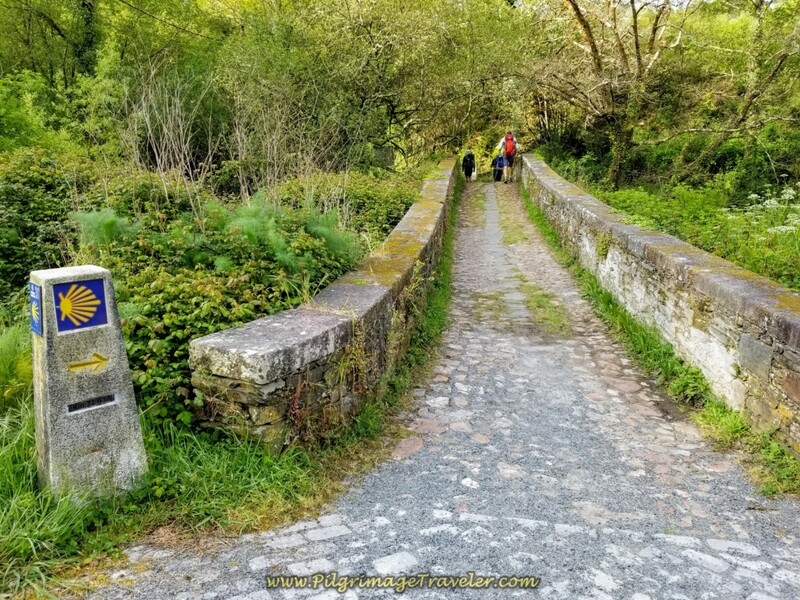 From the moment you cross the bridge, it is uphill from there, beginning the first steep climb of the day toward the next town of Lambre. 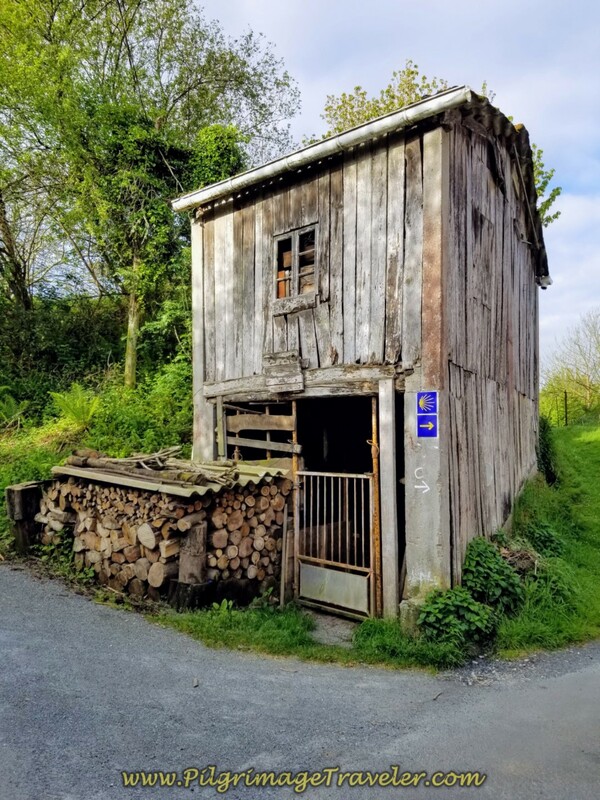 You have reached the top of the first steep climb in about 3/4 kilometer from the bridge, when you reach this house shown below. 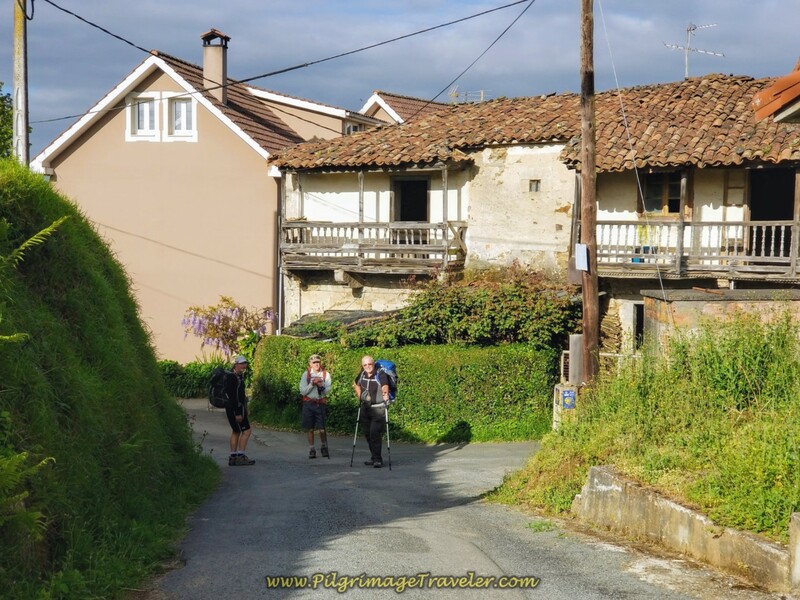 In 100 meters onward, as the Camino now descends, we walked by this interesting old home. 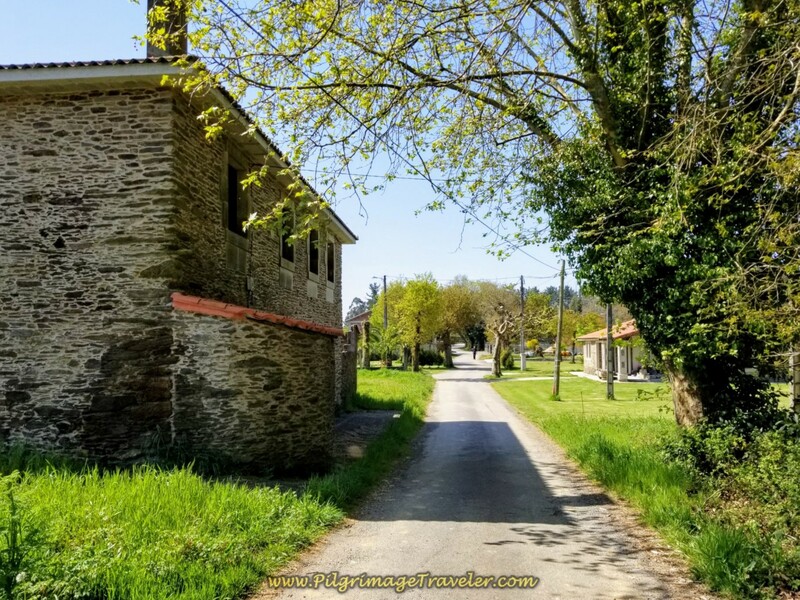 I had the guys pose here, in the hamlet of Trasmil. Just beyond the old house above, you come to this very interesting and eye-catching old wood shed, where you turn right on another paved country road. In less than 1/2 kilometer you descend farther and join the N-651, shown here. However, it is only a brief jaunt of 100 meters along the N-651, before taking a turn to the left to join this narrow road, shown below. 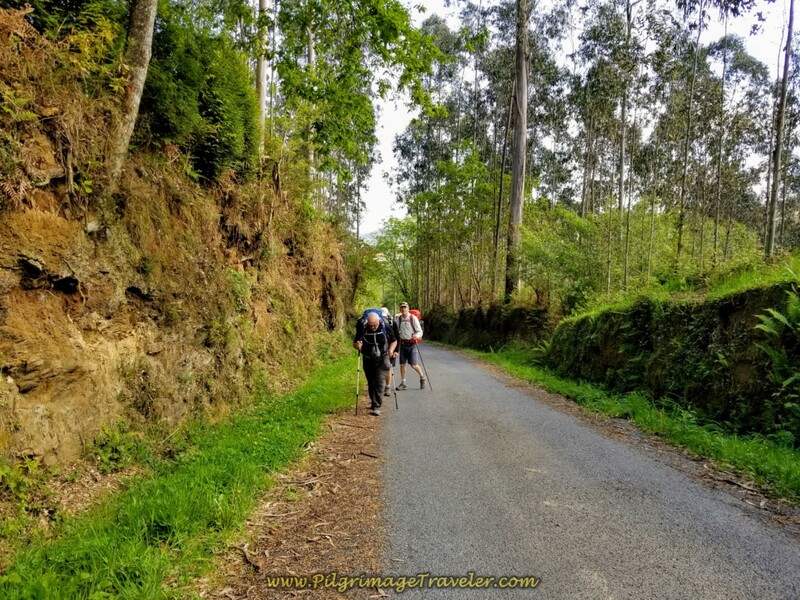 And thus begins the second long and steep climb of day four on the Camino Inglés. 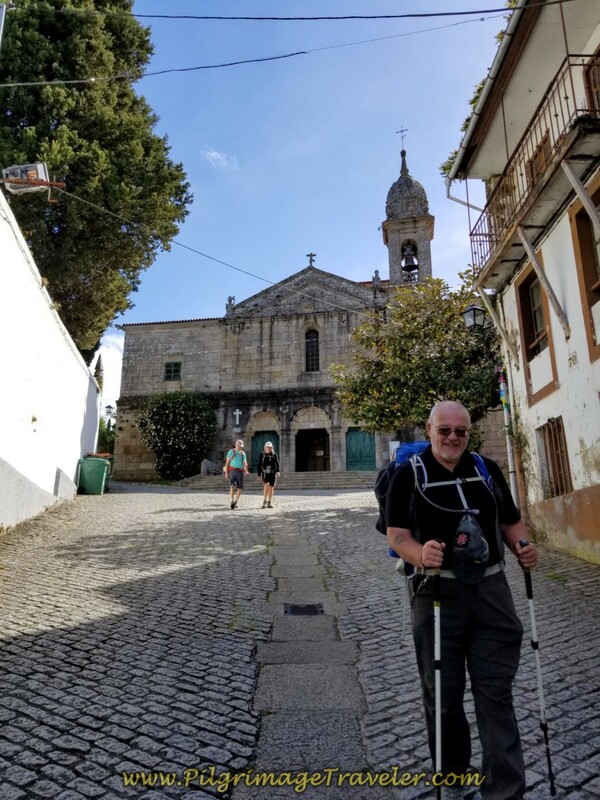 The Way climbs steeply for about 2/3 kilometer, until this short reprieve at the halfway point on day four of the Camino Inglés. 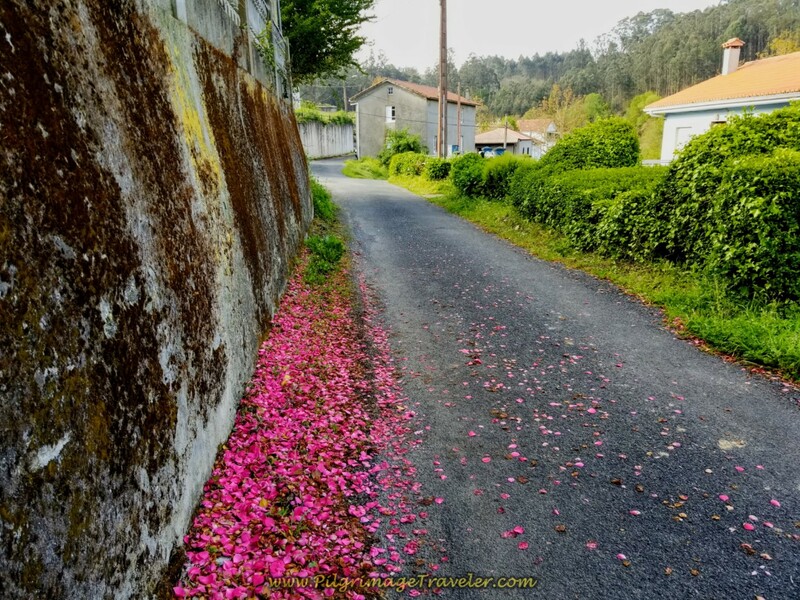 We ambled along in this lovely flat area, by the flower petals, turning right just beyond the building in the middle of the photo. 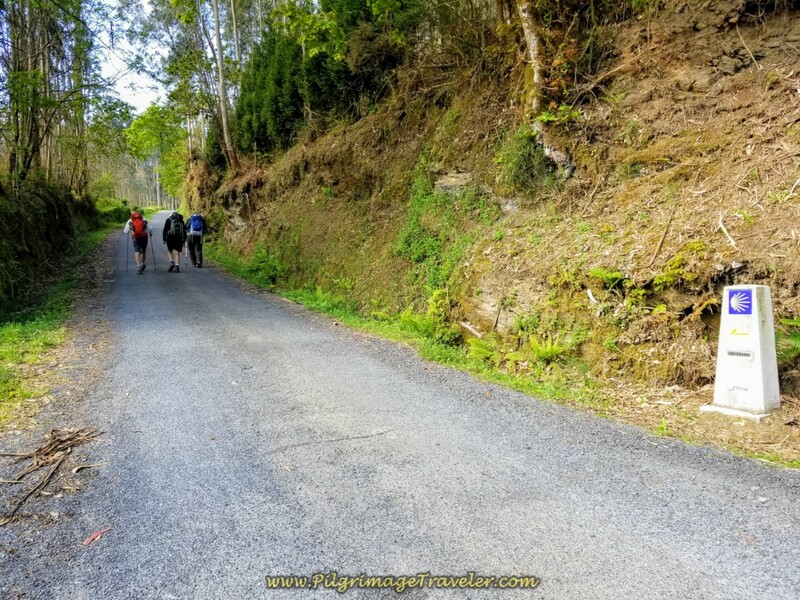 For about 1/2 kilometer more, it was relatively flat until the 69 kilometer marker, shown below, where the second half of the steep climb begins. I ran ahead to photograph the guys from above. You can see how hard they are working with their heads down! 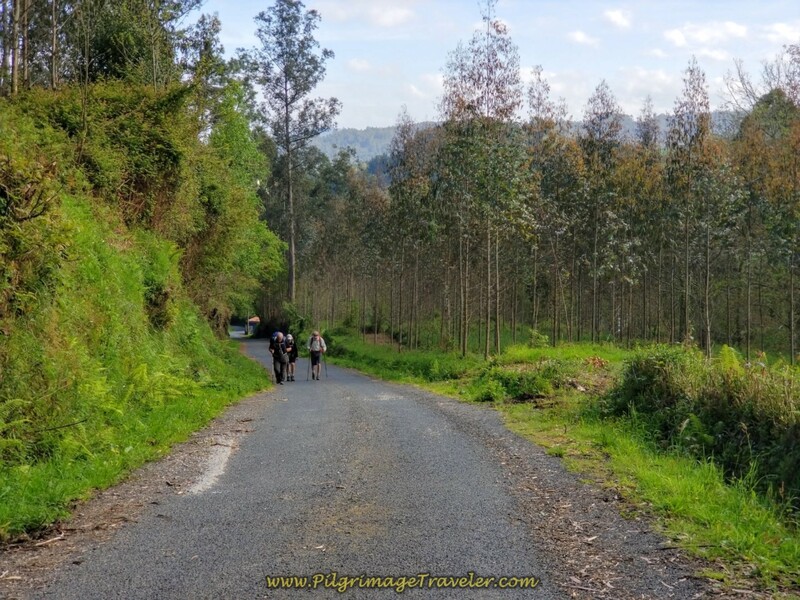 This part of the climb takes you through a lovely eucalyptus forest. And finally in 1.3 kilometers more, your climb is rewarded by this sweeping view at the top! From our high shelf, we could see the views of the river below and miles and miles of countryside. 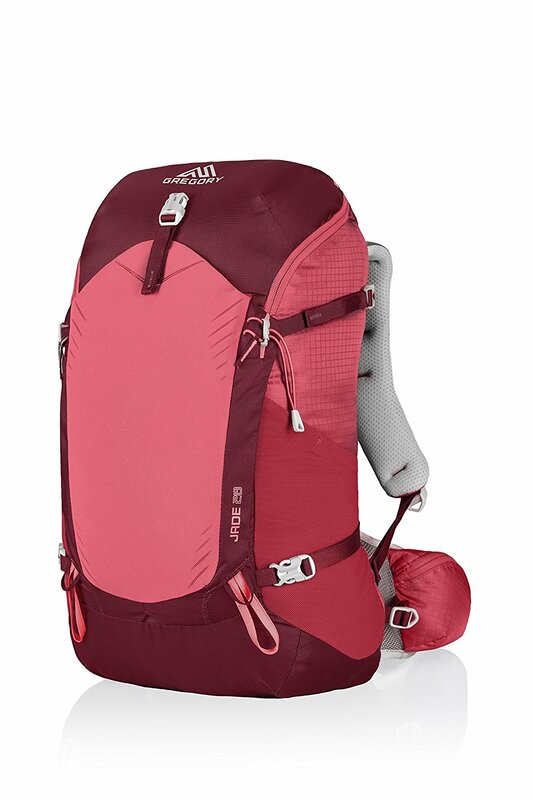 It is a total of almost 2.0 full kilometers of climbing from the N-651. 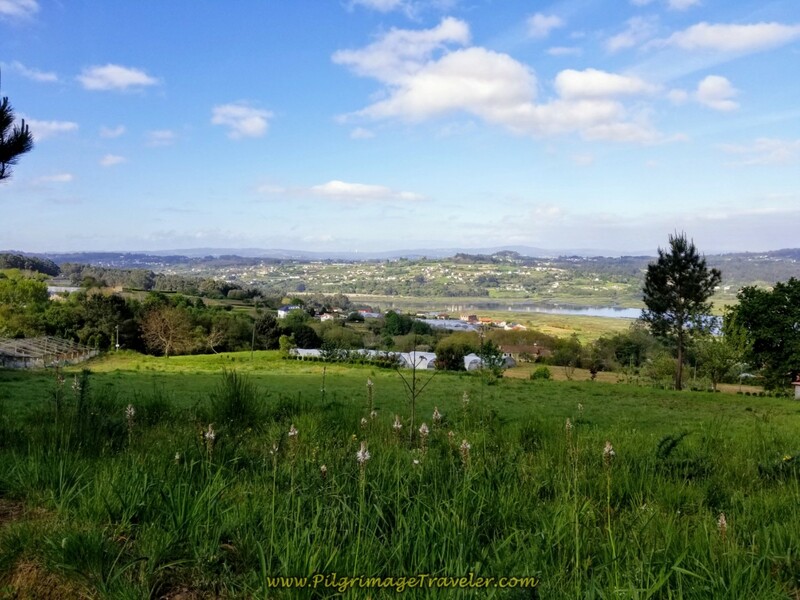 We paused to enjoy the view over the Ría de Betanzos, slow our breath and feel worthy of the climb. We had all done well! 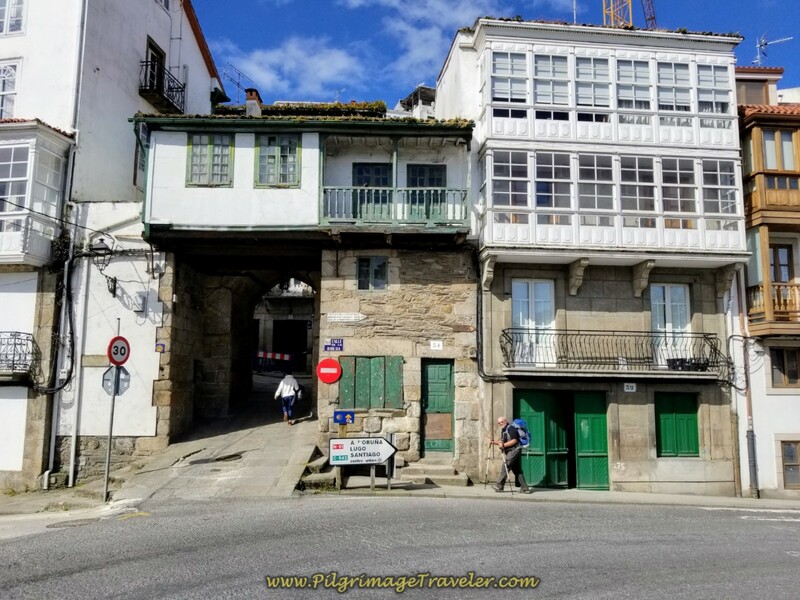 After this open top, it is all downhill from here to Betanzos! 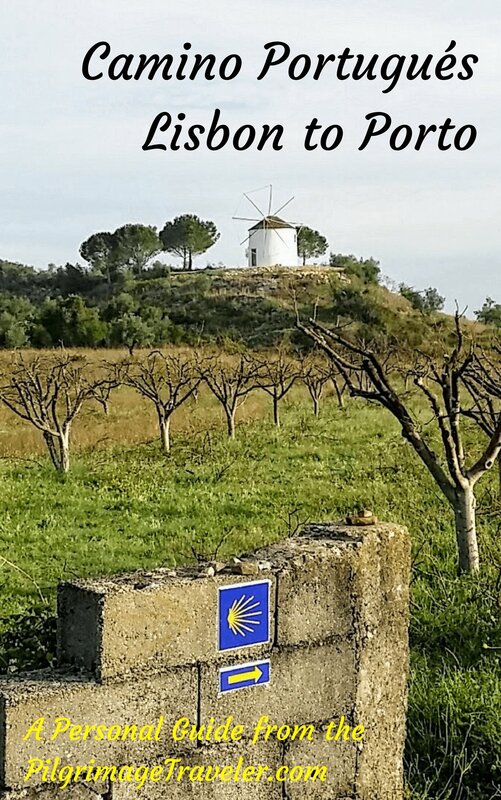 After the top, you are now arriving into the municipality of Souto Gas, as a sign along the way soon announces. 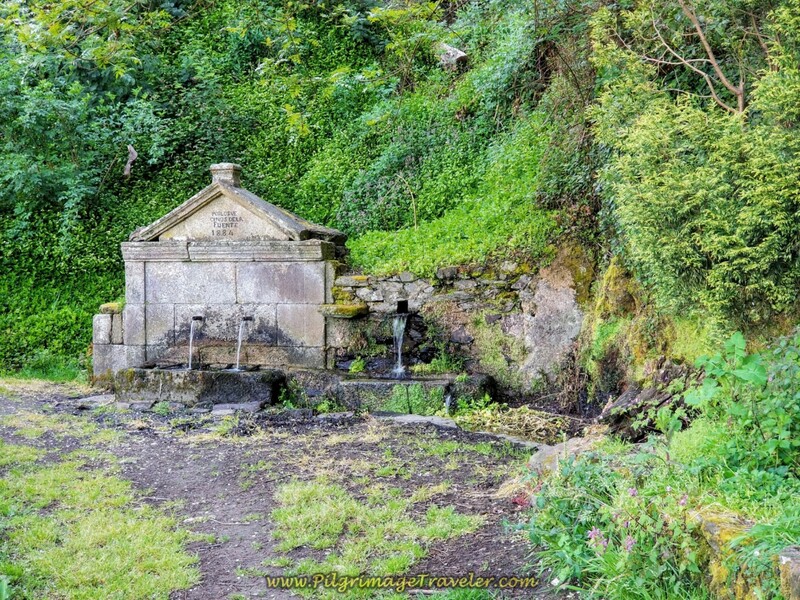 Just 1/2 kilometer onward from the top, is the historic fountain, with an 1884 date written on it. 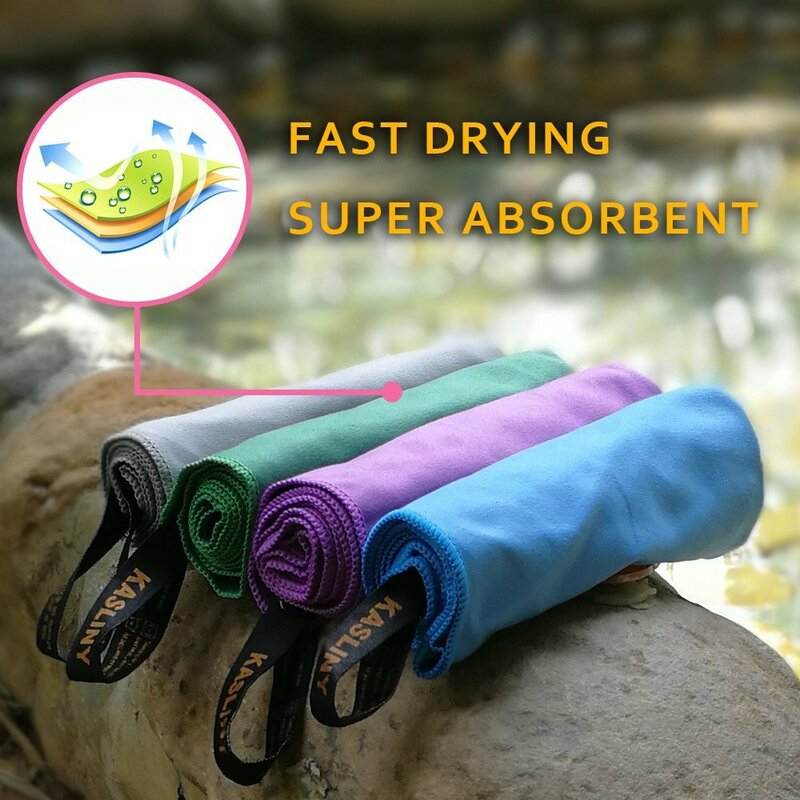 You can fill up your water system here. It is also a cool and shady place to rest if needed! 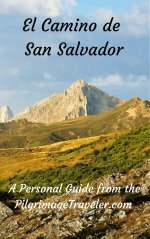 The next hamlet that you walk through is San Paio. Here is Rich and Rob walking by an old washing well, with a stairway across the street to the spring below. We had covered another full kilometer from the fountain above at this point. 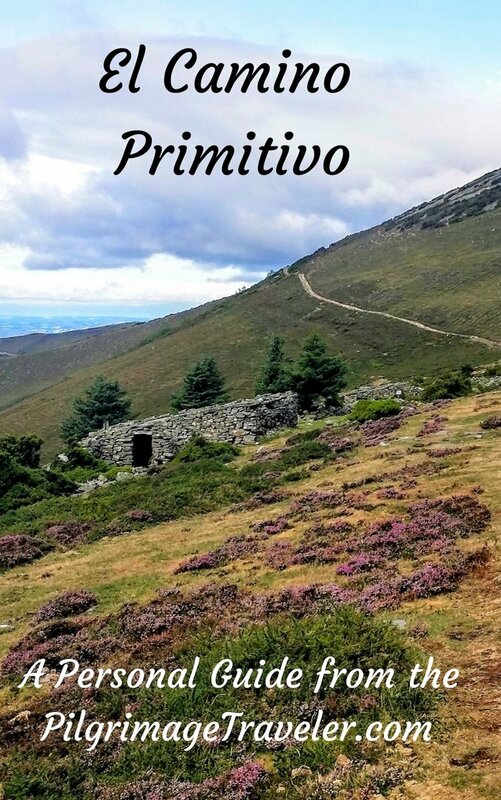 The next attractive feature you come to, in about another 1/3 kilometer is the Igrexa de San Martiño de Tiobre, shown below. This very charming 12th century church was not open both times I walked by, but just wandering through its walled grounds is satisfying. 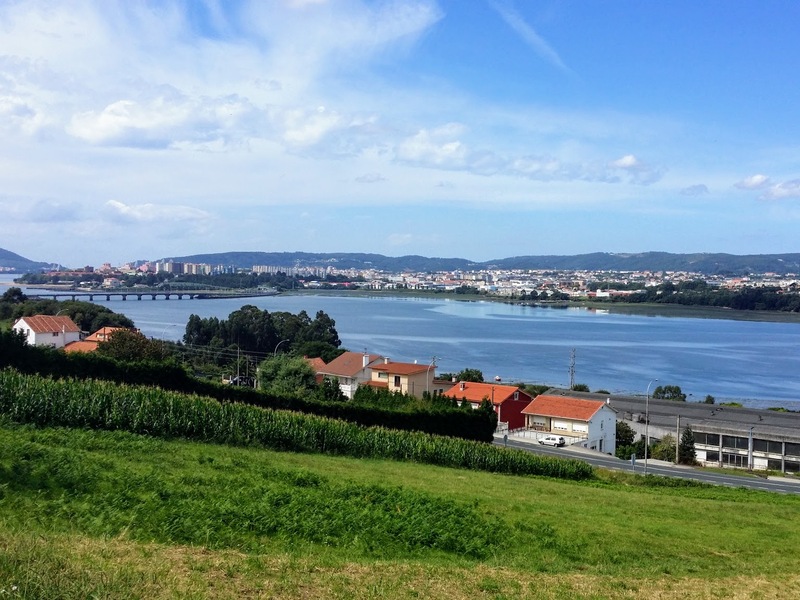 It is a very peaceful place, high on the hill above Betanzos. 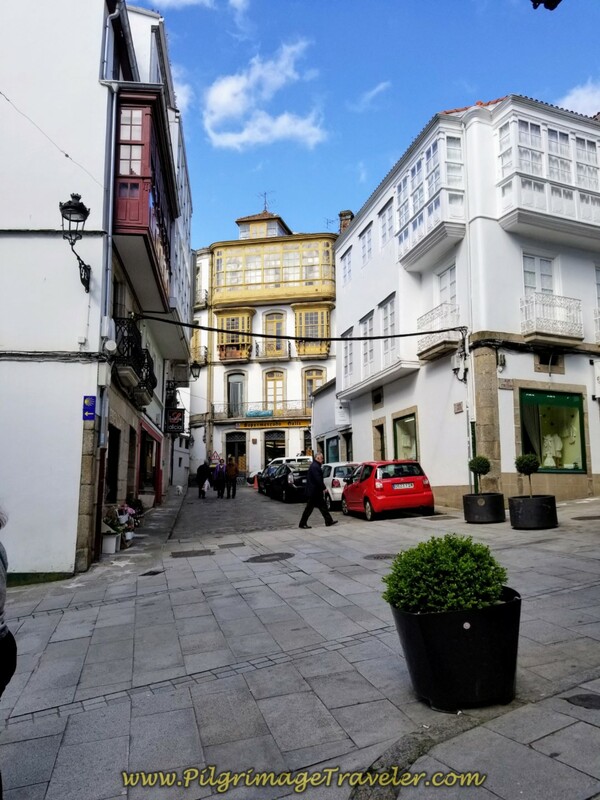 After the church you pick up a street called Betanzos Vello, which means "old" Betanzos in Galician. 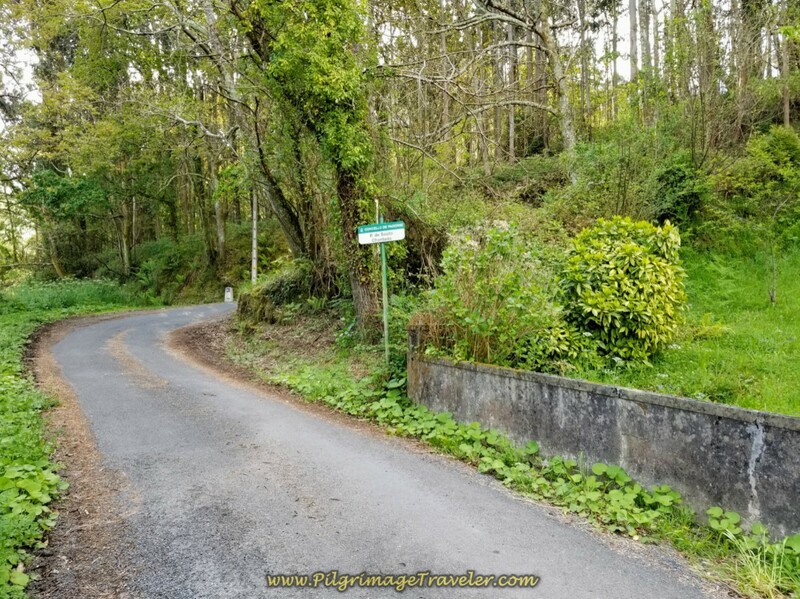 I think this is a lovely name for a road, and you can see we are sailing toward Betanzos on the old road! 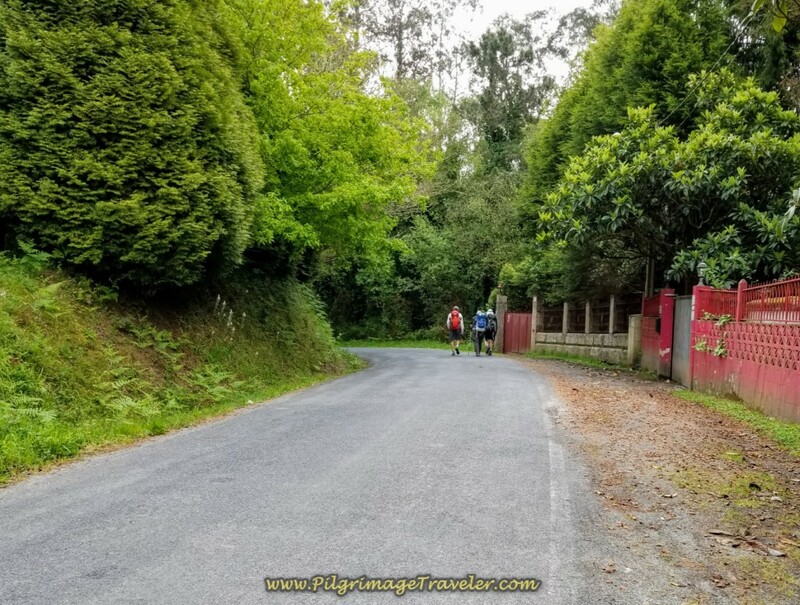 It is a 400 meter walk on the old Betanzos road, then a left and a quick right to begin walking a steep downhill on the Caraña de Arriba, shown below. 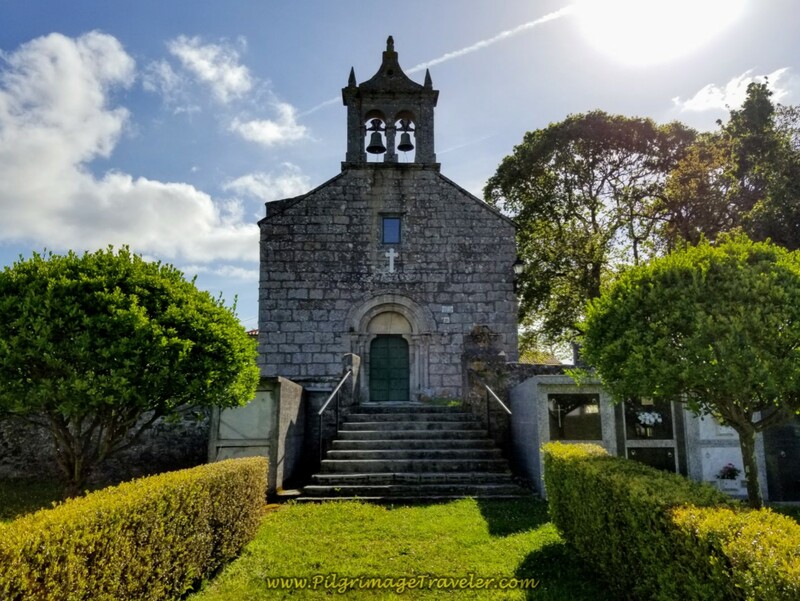 It is not quite a full kilometer until you come to the church and the impressive high walls of its cemetery at the Santuario de Nosa Señora do Camiño. Next is the church itself, farther down the steep hill, shown below. Here the street name takes on the name of the sanctuary and continues down the hill very steeply toward the river! 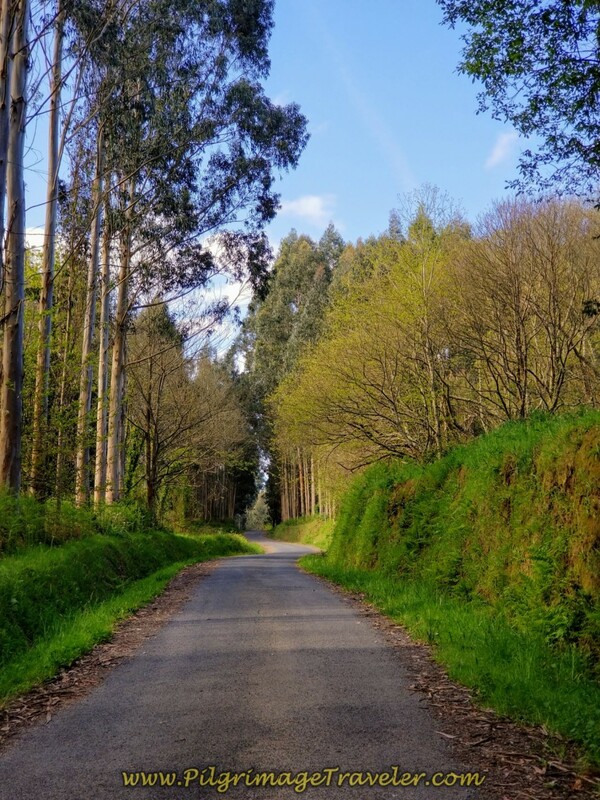 In 250 meters, the Rúa Santuario de Nosa Señora do Camiño meets the N-651 and the Camino turns to the left. 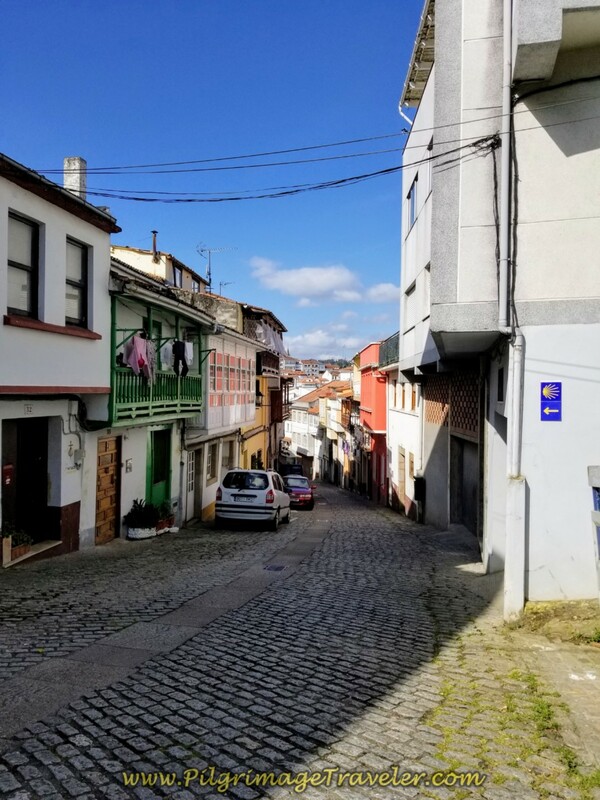 After walking 200 meters more on the N-651 you cross the Río Mandeo to walk into the center of the old medieval town of Betanzos. 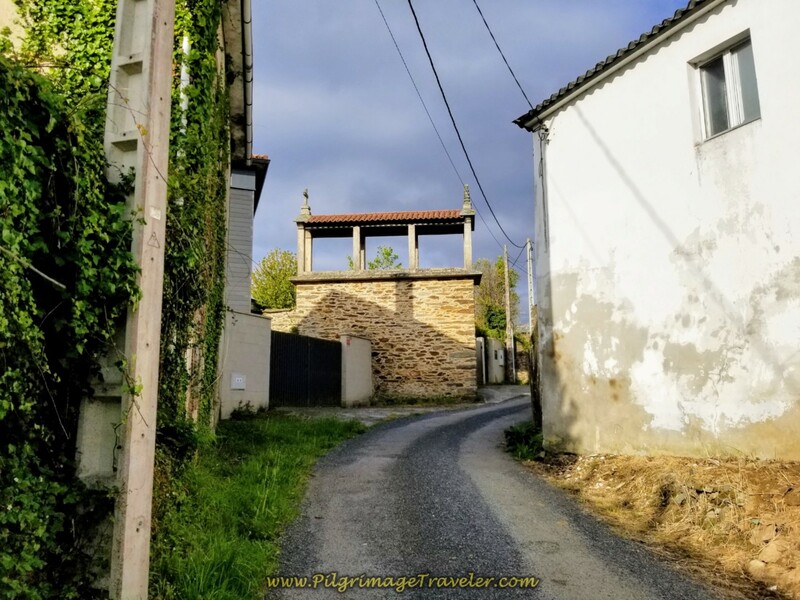 After crossing the river, cross the highway and enter into the old medieval town, through its historic gate, shown below. 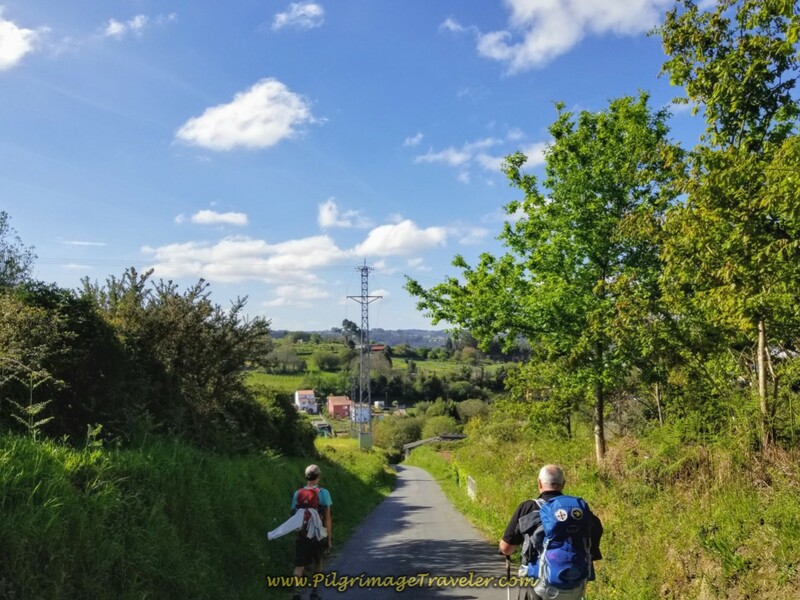 And of course, after the river the Way is uphill, through the gate, to the right then left and up the hill on the Rúa Prateiros, shown below. 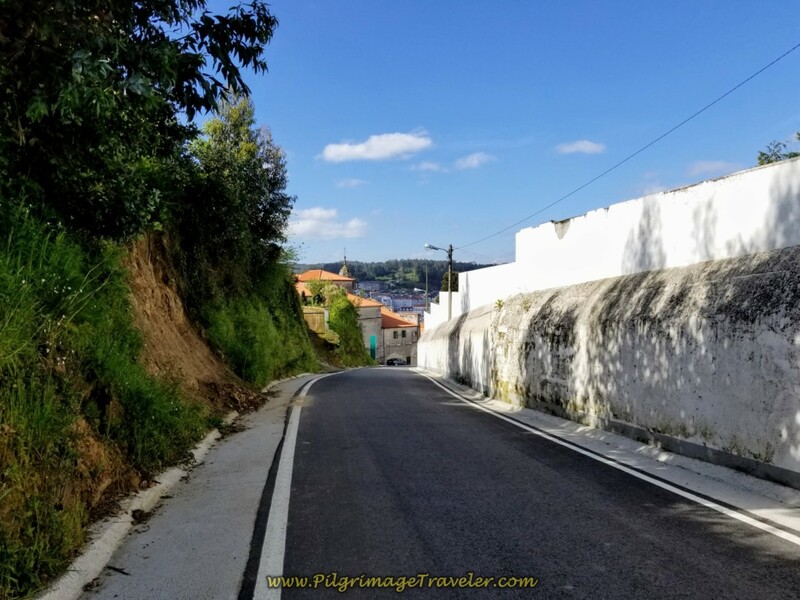 This is a steep climb of about 150 meters toward the center of town. The guys were giving me the evil eye as I asked them to keep on climbing until the main plaza, farther on. We were all tired and wanted a break, but I felt it was worth it to continue on for the amenities in the square. 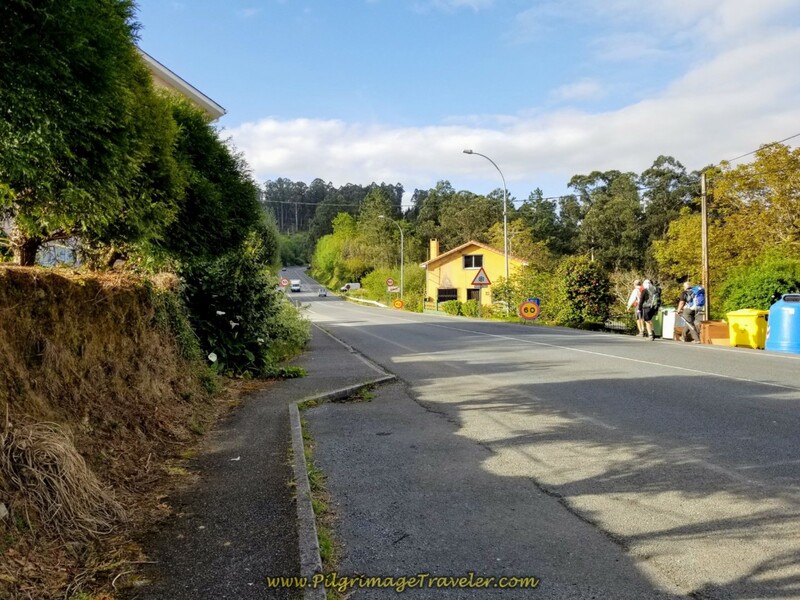 Just before the supermarket shown in the center of the next photo below, the Camino turns left onto the shrubbery-lined Porta do Vila that takes you back down the hill and to the Central Plaza. 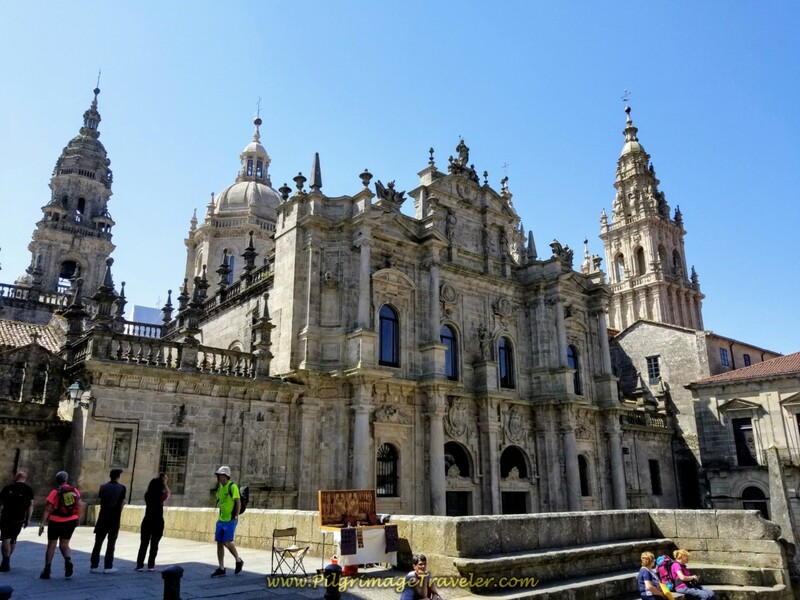 It is a mere 100 meters to the café-lined central square, with the church and convent of Santo Domingo dominating the view. You should be able to find just about anything you need close to this square. It is a wonderful place to sit and relax for awhile! Which is exactly what we did to end this stage of our day. 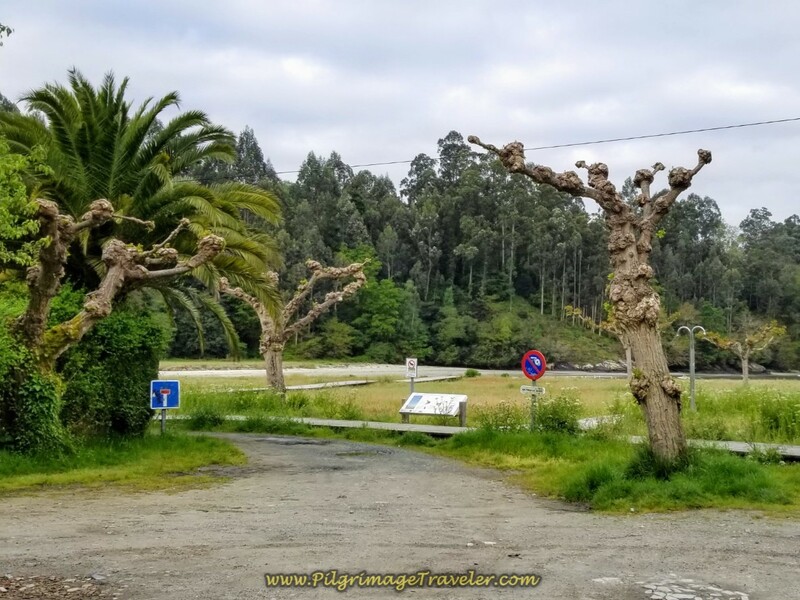 If you are headed to the Albergue de Peregrinos de Betanzos, instead of a left turn towards the central square, turn right and up the hill instead. 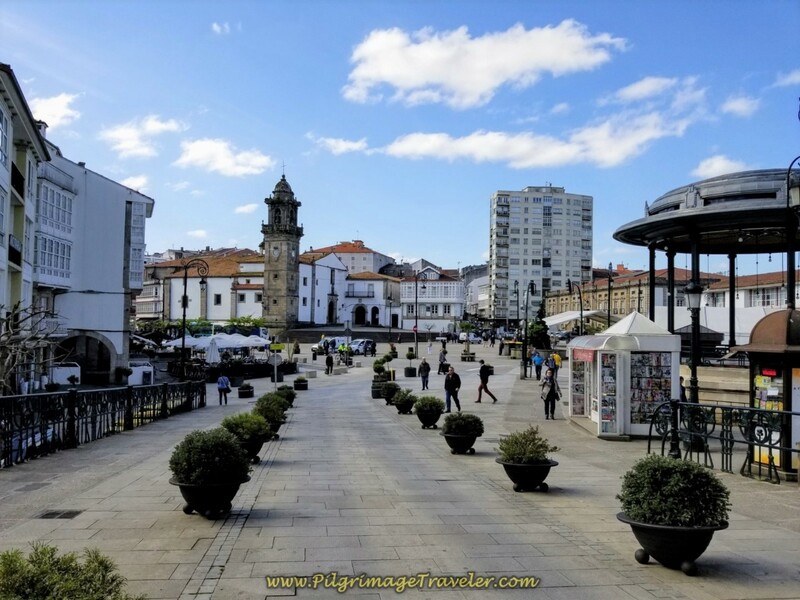 Betanzos is a city of churches and as you head farther up the hill you will soon pass by the Igrexa de Santiago and its tower, shown below. 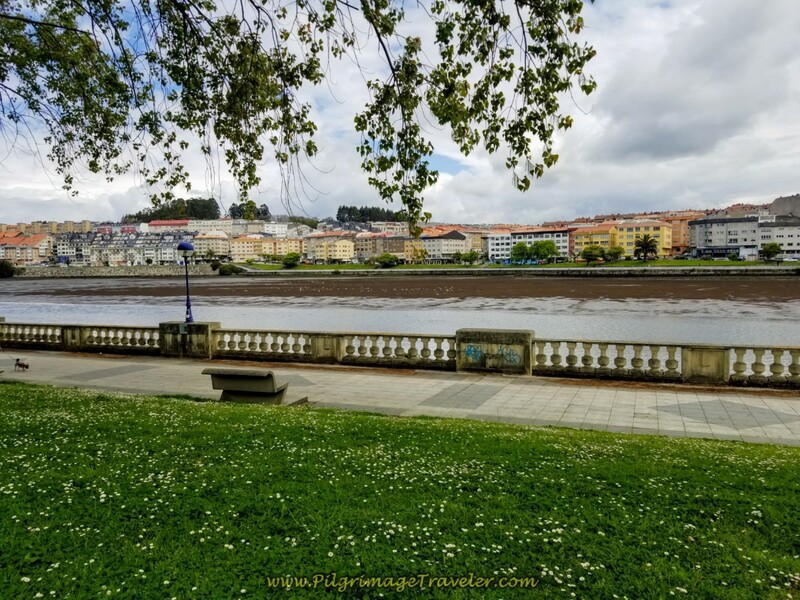 There is an old manor house on the left side of the photo, in the traditional Galician style. 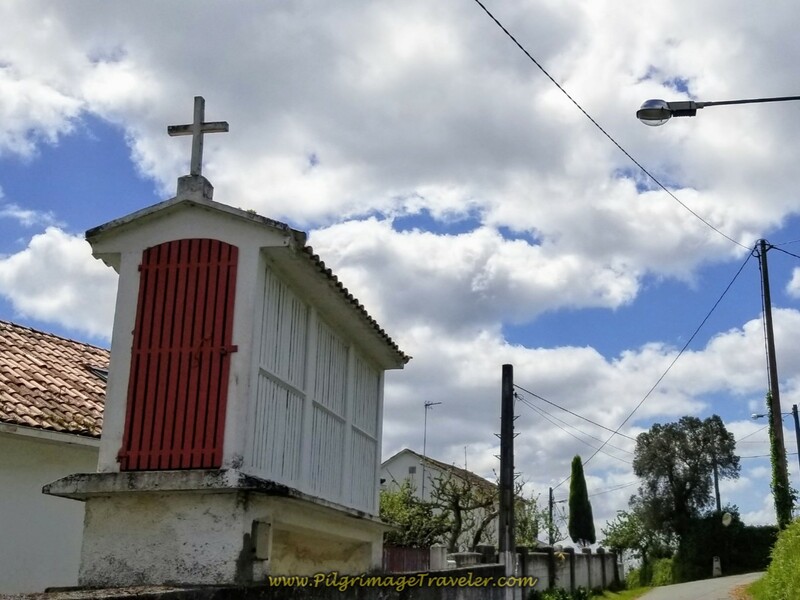 Continue past the church to Santiago and its plaza, stay right and down the hill on the Rúa Roldán and walk a total of not even 200 meters to come to the albergue that you can see on the corner of the Rúa Roldán and the Rúa Pescadería. You can't miss the sign. 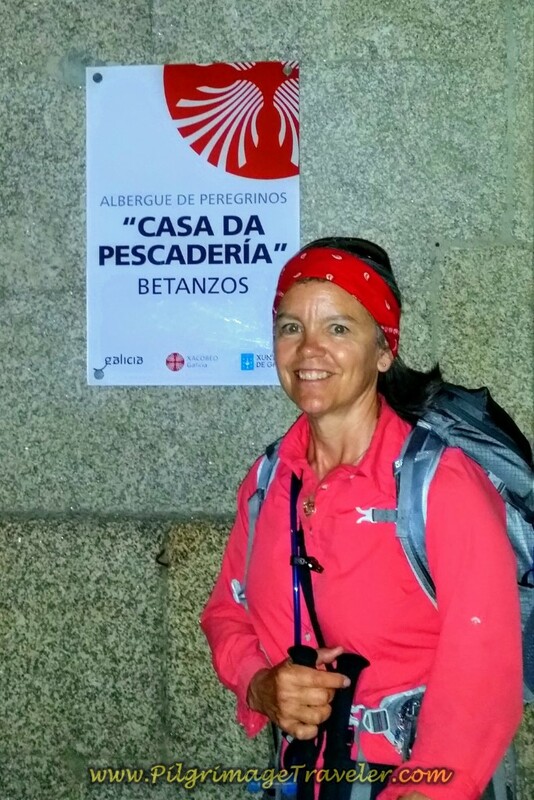 Here I am in the photo below, next to the albergue sign in the early morning light of my prior trip, on the Camino Inglés. 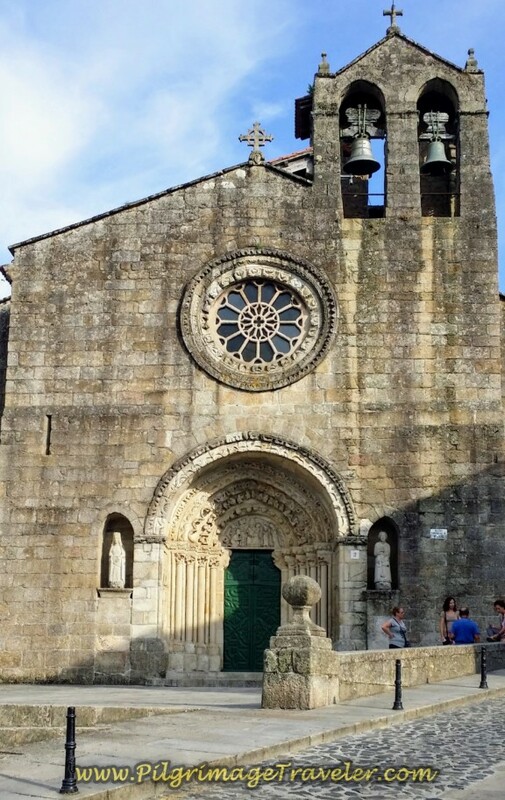 If you continue to follow the Rúa Pescadería, you will come to two more historic churches, the 14-15th century church of Igrexa de Santa María do Azougue, shown above, and the 13-14th century Igrexa de San Francisco, shown below. 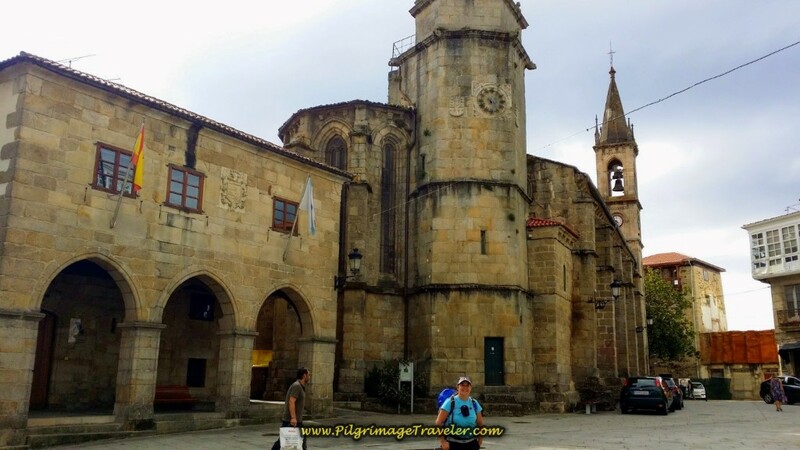 Touring the narrow pedestrian streets and churches of Betanzos is a must. 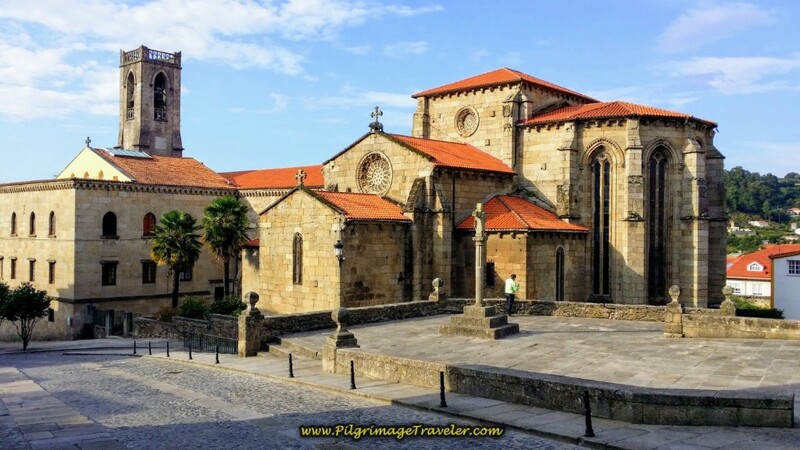 I was able to see several of the churches on a prior trip, but you have to wait until their opening hours, after siesta, about 6:00 p.m.
On my first trip through Betanzos, I stayed at the albergue. On my second trip, we walked onward. 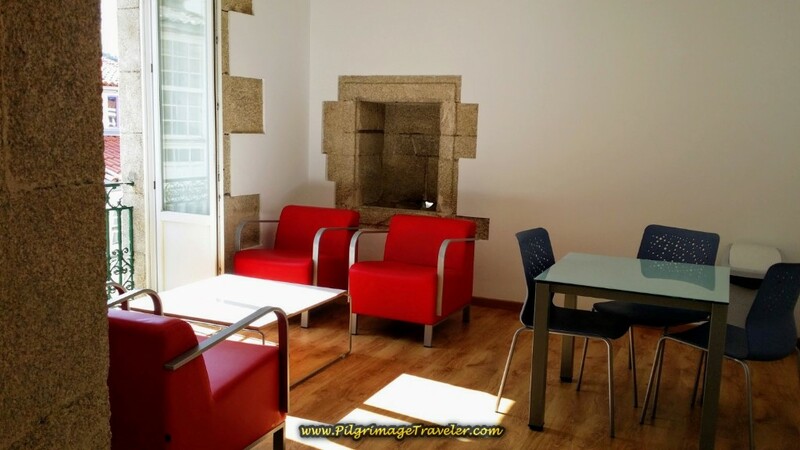 The albergue was opened in 2013, a newly remodeled old building that was clean, adequate and inviting, in a terrific location in the center of the old city. There is a kitchen and 32 places in the dormitory, but no heat. 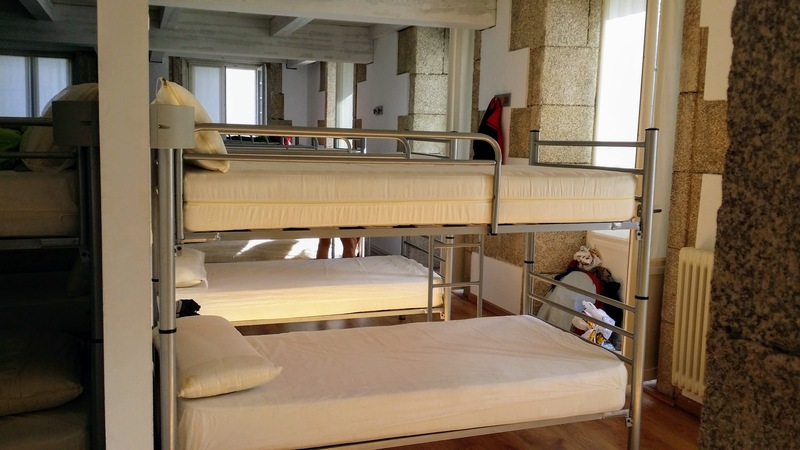 If you chose not to cook at the albergue, there are plenty of bars and cafés very near by. 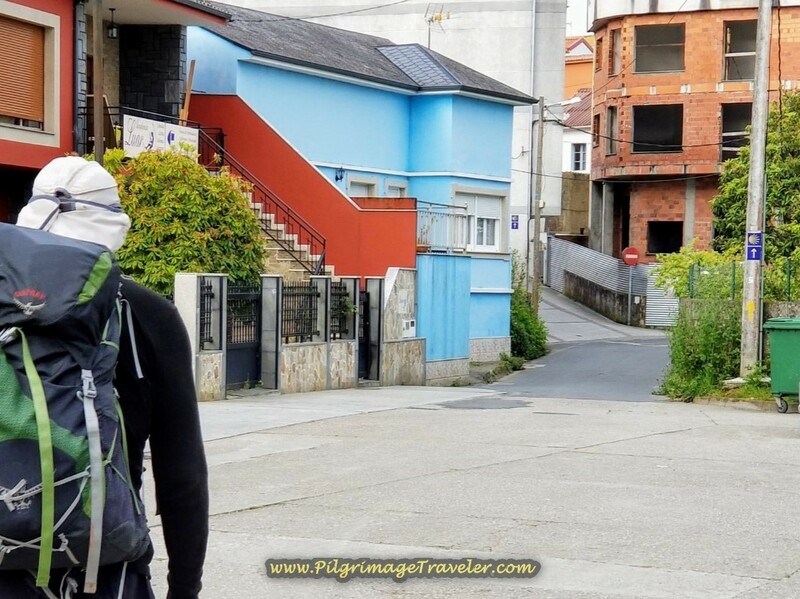 If you don't like albergues, or if this one is full, you can browse booking.com for other accommodations by clicking here. As it turned out, none of the four of us traveling together pushed ourselves too far. 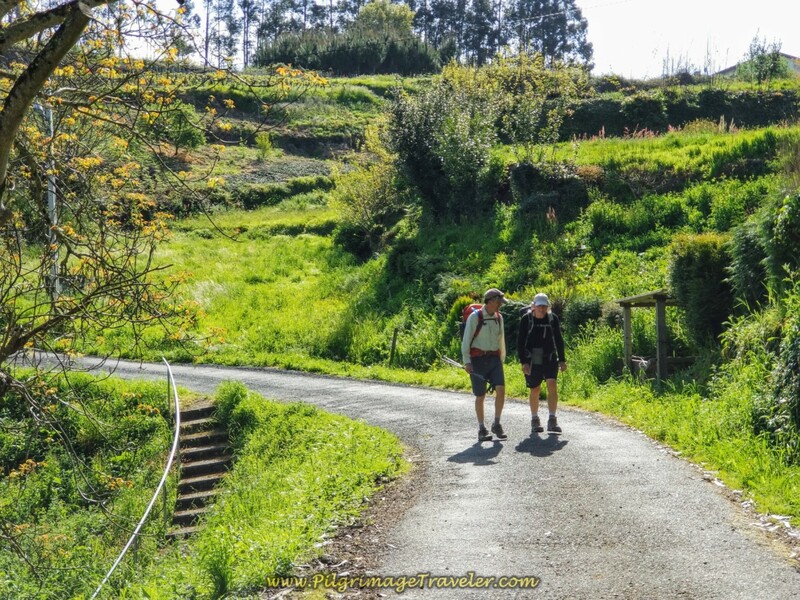 In fact we decided to walk onward on the same day to Presedo, to the next available albergue. We all continued to walk well. 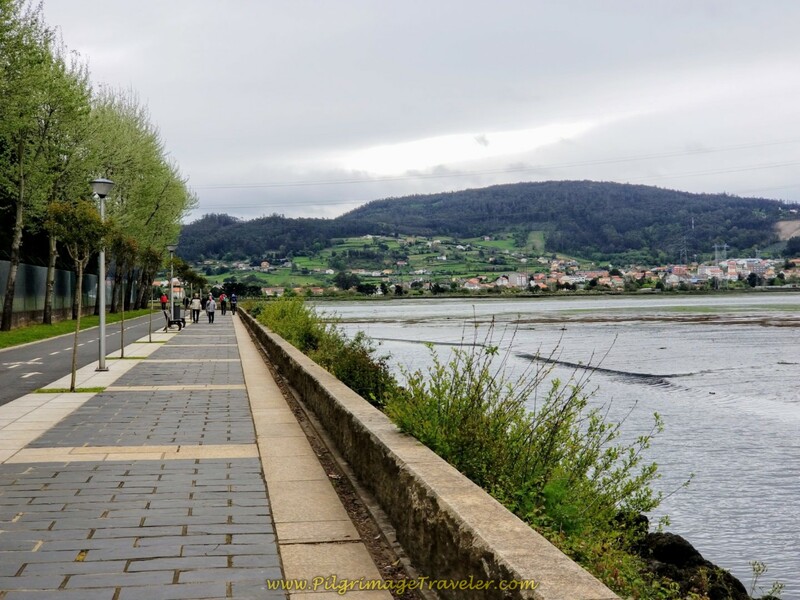 There are plenty of services in both Miño and Betanzos, with not so much in-between. 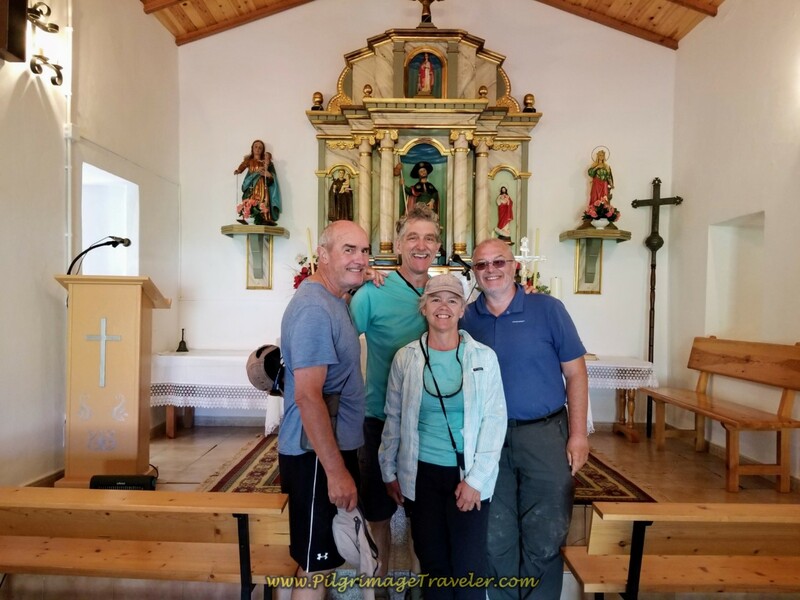 I always advise pilgrims to carry plenty of water and snacks. The countryside is very rural throughout this day. 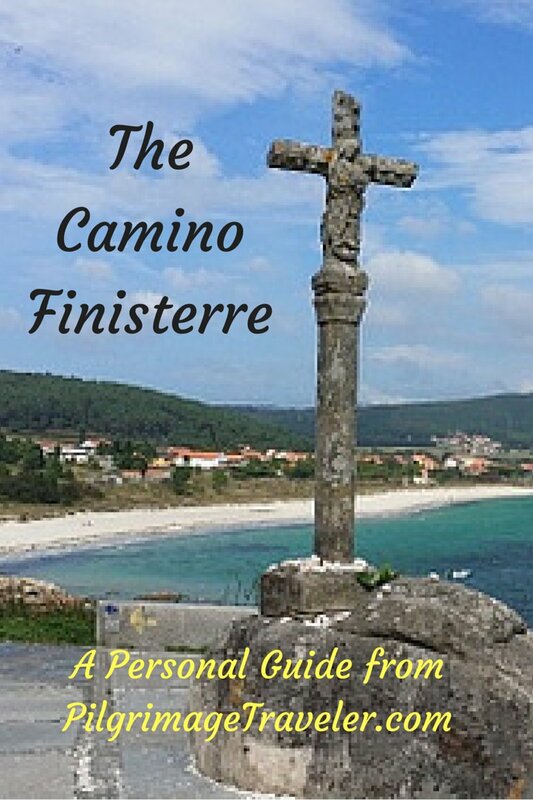 Day four on the Camino Inglés is a beautiful walk, strenuous, yet so very rewarding. The hills are steep but doable. Take your time and maybe stretch yourself a bit more. You will make it. 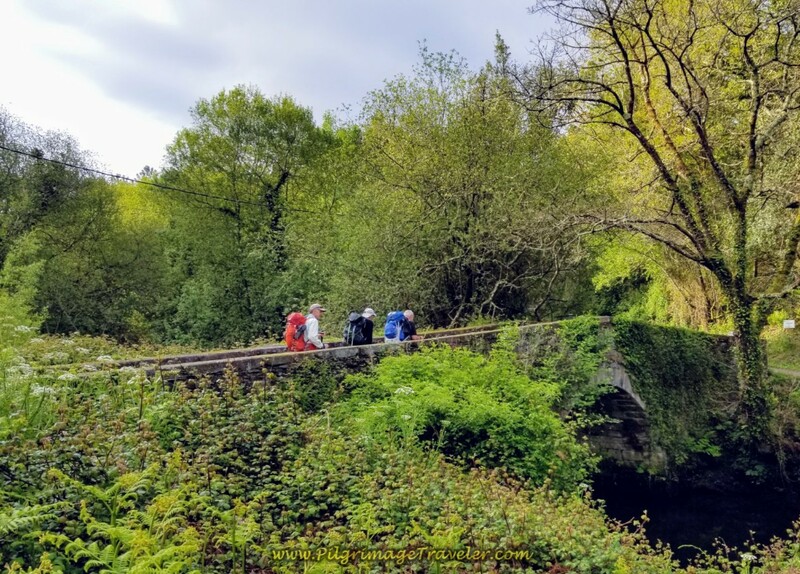 May your own day four on the Camino Inglés involve a bit of risk, so that you too will learn just how far you can go! May your own hill climbing take you to an even higher level than before! 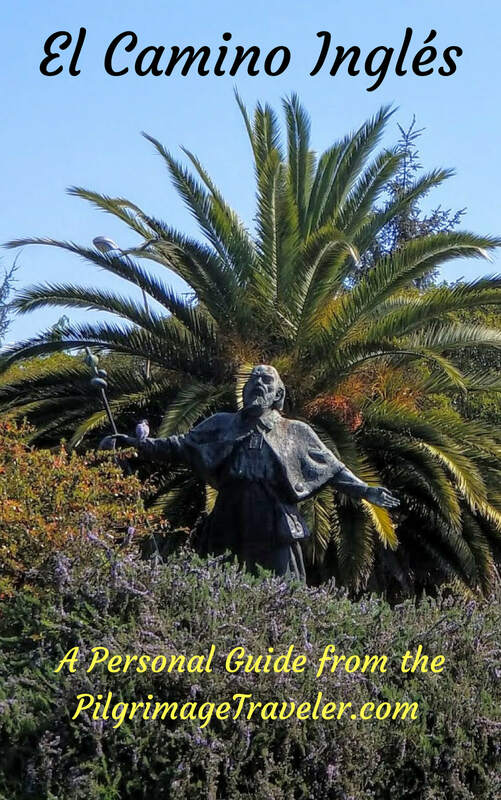 Ultreia!